Clove is a small, brown colored flower bud of the evergreen tree called Syzygium aromaticum is an important spice during the earlier trading and is believed native to the Spice Islands, of Indonesia. 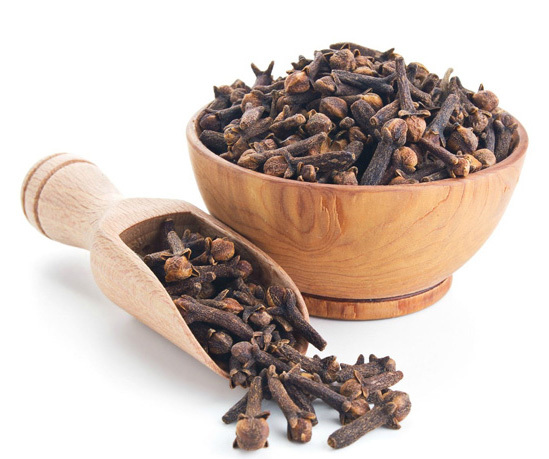 Cloves have a strong aroma with a hot and pungent taste. They are used to flavor foods such as meats and bakery products. Long back, during 200 BC, in China, the messengers from one court to another chewed cloves to refresh the breath while in front of the emperor. Clove cultivation was done mainly in Indonesia. In the early 17th century, the Dutch destroyed cloves completely from all the islands except Amboina and Ternate so that there would be scarcity of cloves. As a result they could increase the price of cloves. The French put an end to the Dutch monopoly, by smuggling cloves from the East Indies to the Indian Ocean islands. Clove is an evergreen tree which grows up to a height of 25 to 40 feet. The clove leaves are small and simple. The clove trees grow from the seeds and they are planted in shady areas. The tree starts to produce flowers at the fifth year. A tree is capable of producing around 34 kg of dried buds. The cloves are the dried buds which are picked by hand during summer season and also in winter. It is then dried in sunlight. The largest producer of cloves in the world is Zanzibar. The length of each clove varies. It may be of size 1/2 to 3/4 inch in length. The oil in cloves mainly contains the aromatic oil eugenol. Due to presence of eugenol the cloves have a pungent smell. The oil can be extracted from it by distillation which can be then used for preparing microscopic slides. It is also good for toothaches. The eugenol has various uses such as in germicides, perfumes, and mouthwashes, as a sweetener etc. Earlier the cloves was grown in the Maluku islands which includes various islands like Bacan, Makian, Moti, Ternate, and Tidore. But then even before the time of Christ, they began to be grown in the Middle East and Europe. Archeologists have discovered cloves inside a ceramic vessel in Syria together with the proof indicating the date of around 1721 BC.